Tarfia Faizullah’s seam investigates an atrocity unfamiliar to many western readers, the March 26th 1971 attack by West Pakistan on the Bengali population of East Pakistan who were at the time agitating for the division of the nation. The resulting war ended in the secession of East Pakistan—now known as Bangladesh. The poems, in sequence, tell the story of how a speaker—sometimes an “I”, sometimes a “you”—researched this horror, through the personal memories of family members and through interviews in Bangladesh. Untitled prose poems between the more traditional pieces drive the narrative—introducing the city of Dhaka, showing that interviewees were found through a support group for women raped during the war, and finally showing the speaker of the poems traveling on a crowded bus by night. Together, both paragraphs and lineated pieces show how history, personal and official, forms from fragments of memory that have already been changed by what has passed since the events, from which they fell, bloomed. The collection opens with “1971,” a five-part poem in which descriptions of life in the weeks before the conflagration are stained with the knowledge of the terrors to come. The light as “Mother watches Grandmother / disappear into water” is “many-leafed” but simile turns that bucolic description violent: “like bits of bomb- / shells gleaming like rose petals.” Breaking the line in the middle of “bombshell” makes the violence linger for an extra instant before it fades into its own remnant, which resembles something beautiful. In the fourth section of the poem, green is the silence into which “the torn woman curls”; the color of the eyes of the soldier who rapes her; the color the earth has been made by rain (it is unclear whether during the war or beforehand); and the color of the water in which the grandmother, in more peaceful times, bathes. The timeframes of these pieces alternate, with some lines indented from the left margin to emphasize their fragmentary nature. “Gather these materials,” a command repeated throughout the sections of the poem, points to the process of history being created: these shreds are brought together, whether in poetry or in more direct narratives. Both, I said, both . . .
She would not choose one aspect of her identity then and will not choose now—the sliver of memory that becomes part of the history compiled by the interviewer is summoned by the question that asks her to choose. The interviewer’s thoughts change history by influencing which materials may be gathered to make it and by themselves becoming parts of the history being recorded. with bluebells . . .
to unnail myself from my own body. The slippage between “she” and “I” underscores the challenge and unavoidable incompleteness of such separation. This, after all, is one of the toughest seams—between memory and history, between personal outrage and the sometimes impersonal telling of what has happened in the world—but seams are not just separation: they are also a joining. 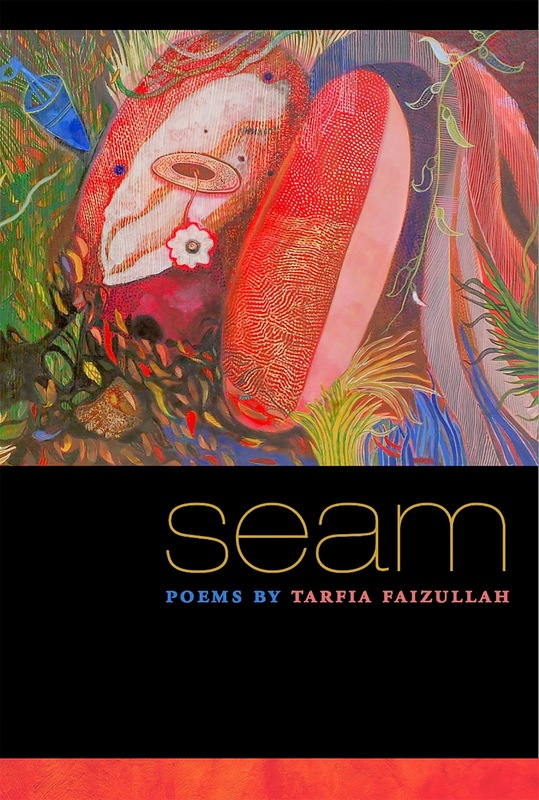 Tarfia Faizullah’s seam shows us that history should admit the emotions that come with more personal memory and, more radically, that memory can include even that which did not happen to ourselves or to the ones we love. Poetry can best address the horrors of history—and of the present day—through such a gathering of the impersonal and intimate.